News from Edmiston that Jonathan Barbe has signed the 31.5m motor yacht Saigon for sale. 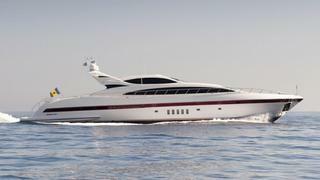 Built by Overmarine in 2004, she is part of their Mangusta 105s range designed by Stefano Righini. She features a contemporary interior designed by Studio Bacigalupo and can accommodate up to 9 guests in 4 cabins - a master suite, a VIP, a double and a twin + Pullman. Twin MTU 12V 396 TE94 engines driving KameWa water jets give her a cruising speed of 28 knots and a top speed of 32 knots. She is in immaculate condition, having only been used privately and stored under covers in her yard during the winter. She has only 800 hours on her main engines which have been recently overhauled and fully serviced by KameWa. Saigon is asking €2.5 million.